The greatest commercial maritime disaster (just edging out the Titanic by death-toll) occurred on April 27, 1865 when the steamboat Sultana exploded and sank on the Mississippi River near Memphis Tennessee. Approximately 1,700 passengers, most of them recently discharged Union soldiers on their way home, lost their lives. 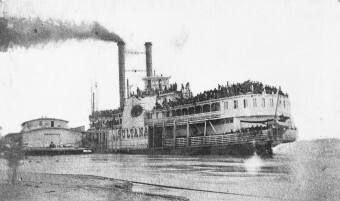 The Sultana was considered a state-of-the-art steamboat when it was built in 1863. It was 260 feet long and could legally carry 376 passengers. Like many other boats, the Sultana came under fire during the Civil War. In 1863, its upper works sustained heavy damage on two occasions. As the war went on and the North began to overtake more of the Mississippi River Valley, the Sultana was called upon to carry troops and supplies for the Union Army. On 21 April 1865, the Sultana made its way from New Orleans and headed north. As the boat was moving upriver, a crew member discovered a leaking boiler and hired a boilermaker to address the issue in Vicksburg, Mississippi two days later. After assessing the damage the boilermaker, R.G.Taylor, informed Captain J. Cass Mason that two sheets needed replacing. Not wanting to waste time or money, Mason told Taylor to patch up the problem for the time being, and assured the boilermaker he’d fully address the situation once he reached St. Louis. Taylor thought this was a bad idea, but did the minimal work Mason requested and sent the Sultana her way. Why was Captain Mason in such a hurry? Newly released Union prisoners of war were waiting in Vicksburg to catch a ride north to Illinois. The U.S. government was paying out five dollars a man, and steamboat captains were offering lucrative kickbacks to Army officers who filled their boats with returning soldiers. On April 24, the Sultana left Vicksburg carrying approximately 2,300 passengers, about six times its normal capacity. The former POWs were weakened from hunger and disease. Yet they were understandably in excellent spirits despite the cramped quarters since the war was behind them, and they were finally on their way home to their families. The Sultana reached Memphis, Tennessee on April 26 to unload cargo and to pick up coal across the river in Arkansas. At 2 a.m. on April 27, the patched boiler exploded, followed by two of the three other boilers in quick succession. Hissing steam and red-hot shrapnel flying like missiles killed many passengers immediately. Others were hurled into the dark, frigid river like rag dolls from the violence of the explosion. Desperate passengers grabbed whatever they could lay their hands on to use as makeshift life preservers – doors, mattresses, bales of hay – as there was only one lifeboat on board the ship. The flood conditions of the river, the black of night, and the poor physical condition of most of the passengers also made the odds of survival very slim. At least 1,700 of the 2,300 or so people aboard lost their lives that night, and yet the tragedy garnered very little attention at the time. As newsworthy as it was, the Sultana Disaster occurred in April of 1865, a month of unprecedented events in American history. General Robert E. Lee surrendered. President Abraham Lincoln was felled by an assassin’s bullet. On April 26th, the day before the Sultana went down, John Wilkes Booth, Lincoln’s killer, was caught and shot dead. The word, “maritime,” is not accurately used in reference to fresh-water bodies (e.g., rivers, lakes), such as the Mississippi. In English, there are three words that are to be used to refer to river-related matters. Of the three, I recommend “fluminous” (from the Latin, “flumen,” which means “river”). The other two are “fluvial” (from the Latin, “fluvius,” also meaning “river”) and “potamic” (from a Greek word for “river”). PS: Despite the error, this was a good article, and I learned a lot from it. Thanks.